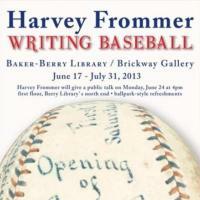 “Writing Baseball,” a multimedia exhibit based on the writings and collections of MALS professor Harvey Frommer, is on display from June 17-July 31 along the brickway on the first floor of Berry Library. The exhibit centers on three themes: “Old Time Baseball,” “Red Sox vs. Yankees,” and “Breaking Baseball’s Color Line,” all of which are evoked through Professor Frommer’s writings, photographs and display of memorabilia. A widely published and well-known sports author and oral historian, Frommer is the author of 41 baseball books including Remembering Yankee Stadium and Remembering Fenway Park. He will recount some of his experiences as a chronicler of the national pastime in a talk at 4 p.m. on Monday, June 24 at the north end of the first floor of Berry Library. All are welcome!